Will Grigg is expecting Wigan Athletic to have to be patient on Saturday to break down Rotherham. Like Latics, Rotherham came up from League One last term, and they have also registered two wins from their opening five games. They sit a point behind Paul Cook’s men, who have started the season with a blistering 10 goals – double that of Saturday’s opponents. But Northern Ireland striker Grigg says Rotherham will be hard to unlock on Saturday. “They’re one of the best teams we’ve played at the DW Stadium last year and they’ll come with a gameplan,” said Grigg. “They’ll make it difficult for us to break them down. “They played Millwall and beat them 1-0 and I think a lot of their score lines this season will be similar. Rotherham beat Wigan earlier this month in the Carabao Cup, but Grigg says there is little point reading into that encounter given the number of changes that were made for the clash. “It’ll be two different lineups and they had a good result at the weekend, so it’ll be a tough game,” he said. 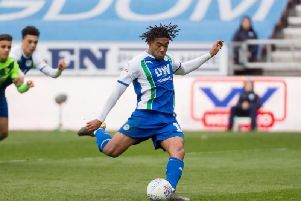 In their first two games at the DW this term, Latics have impressed with a 3-2 win over Sheffield Wednesday and a 2-2 draw with Nottingham Forest. “It might not be Forest or Sheffield Wednesday, it might take a bit more time and we’ll have to be more patient,” said Grigg.